Kjo është një listë e qyteteve të antike në Iliri, qytezave, fshatrave dhe kështjellave të Ilirëvet, Venetëve, Liburnëve, Romakëve, Keltëvet, Thrakëve, Dakëve dhe Grekëvet e vendosur në apo afër tokavet Ilire. Një numër të qyteteve në Illyria dhe më vonë Ilirikumi romak janë ndërtuar ose rindërtuar afër vendbanimeve të para ekzistuese Ilire. Dimale, një qytezë e lokalizuar në the territorin e fisit parthinëve afër Krotinës, Rrethi i Beratit. Hedum Kastelum, ishte kryeqytet i fisit ilir "Desidiatët". Është lokalizuar në qytezën moderne Breza, në Bosnje dhe Hercegovinë. Meteon Kalaja ka qëndruar në përdorim deri në ditët tona. Eugenium fshat ose fortesë e fisit ilir të parthinëve. Bargulum fshat ose fortesë e fisit ilir të parthinëve. Promona - tani Tepljuh pranë Drnishit, i okupuar nga Dalmatët nga gjysma e dytë e shek. I p.e.s. ^ Wilkes, J. J. The Illyrians, 1992, ISBN 0-631-19807-5, page 174, "... 174 Greek lllvrians Bassania, a town under Roman control. ^ The Cambridge Ancient History, Volume 3, Part 1: The Prehistory of the Balkans, the Middle East and the Aegean World, Tenth to Eighth Centuries BC by John Boardman, I. E. S. Edwards, N. G. L. Hammond, and E. Sollberger, 1982, page 629, ". ^ Wilkes, J. J. The Illyrians, 1992, ISBN 0-631-19807-5, page 223, "Among the southern Illyrians the deposits which provided Damastion (Strabo 7.7, 8), somewhere in the Ohrid region, with a silver coinage may be the same ones that attracted Corinthian. ^ In An Inventory of Archaic and Classical Poleis by Mogens Herman, ISBN 0-19-814099-1, 2004, "As a long-distance trading community, Aigina was not an active coloniser, but colonised Kydonia (no. 968) in 519, Adria (no. 75) c.
^ Gruen, Erich S. (1986). The Hellenistic world and the coming of Rome. University of California Press. f. 381. 978-0-520-05737-1. Marrë më 5 July 2011. ^ Classica et mediaevalia. Dansk selskab for oldtids- og middelalderforskning. 1954. Marrë më 5 July 2011. ^ Winnifrith, Tom (2002). Badlands, borderlands: a history of Northern Epirus/Southern Albania. Duckworth. f. 33. 978-0-7156-3201-7. Marrë më 5 July 2011. ^ Stipčević, Aleksandar (1977). The Illyrians: history and culture. Noyes Press. f. 99. 978-0-8155-5052-5. Marrë më 5 July 2011. ^ Wilkes, J. J. The Illyrians, 1992, p. 120, ISBN 0-631-19807-5, page 177, "... who appears to have ruled after 168 Bc at Queen Teuta's old stronghold Rhizon (Risan). ^ Rome and the Mediterranean: books XXXI-XLV of The history of Rome from its ... - page 581 by Livy, Henry Bettenson - 1976, ISBN 0-14-044318-5, "Next he arrived at Scodra, the centre of resistance to the Romans not merely because ... it was by far the best-fortified town of the tribe of the Labeates. ^ The Illyrians by John Wilkes, page 213, "The list of Roman settlements includes some of the [. ^ Wilkes, J. J. The Illyrians, 1992, ISBN 0-631-19807-5, page 172, "... his ally. ^ The classical gazetteer: a dictionary of ancient geography, sacred and profane by William Hazlitt, 1851, "Epicaria qytezë e fisit Cavi në Illyria." ^ Wilkes, J. J. The Illyrians, 1992, ISBN 0-631-19807-5, Page 188, "... after whom the Roman province Dalmatia was named, their own name being derived from their principal settlement Delminium near Duvno. ^ Wilkes, J. J. The Illyrians, 1992, ISBN 0-631-19807-5, page 197, ". ^ a b Excavations at Salona, Yugoslavia, 1969-1972: conducted for the Department of Classics, Douglass College, Rutg, by Christoph W. Clairmont, 1975, ISBN 0-8155-5040-5, page 4, "If we are correct in our interpretation of the earliest finds from Salona, the emporion, even if very small, was a settlement in a strategic position. ^ a b c Dalmatia by J. J. Wilkes, 1969, page 227, "In this area were three small communities of the Delmatae Pituntium(Podstrana) Nareste(Jenesice) and Oneum (Omis). ^ Dictionary of Greek and Roman Geography by William Smith, 1856, page 748." ^ Dalmatia by J. J. Wilkes, 1969, page 194, "By the early years of Augustus the inhabitants of Alvona the Alutrenses. ^ Dalmatia by J. J. Wilkes, 1969, page 195, "At Flavona the native population was well established and stood up better to the effects of italian settlement in the first century. ^ Dalmatia by J. J. Wilkes, 1969, page 216, "Little is known about Sidrona the city of the Sidrini." ^ Wilkes, J. J. The Illyrians, 1992, ISBN 0-631-19807-5, Page 96, "... whose land is the city Epidamnus. ^ Wilkes, J. J. The Illyrians, 1992, ISBN 0-631-19807-5, Page 99, "... 99 victory would be theirs if they received Cadmus as king. ^ Wilkes, J. J. The Illyrians, 1992, ISBN 0-631-19807-5, Page 97, "...the Bylliones beyond the river Aous in the hinterland of Apollonia . ^ Wilkes, J. J. The Illyrians, 1992, ISBN 0-631-19807-5, Page 273, ". ^ An Inventory of Archaic and Classical Poleis: An Investigation Conducted by The Copenhagen Polis Centre for the Danish National Research Foundation, ISBN 0-19-814099-1, 2005, page 1333, "...refounded as a Hellenic Byllis not yet a polls in 400. ^ Dalmatia: research in the Roman province 1970-2001 : papers in honour of J.J by David Davison, Vincent L. Gaffney, J. J. Wilkes, Emilio Marin, ISBN 1-84171-790-8, 2006, page 21, "...completely Hellenised town. 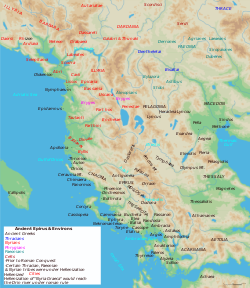 ^ Epirus, 4000 years of Greek history and civilization, page 144, "...the basically Greek character of its inhabitants. ^ OxfordJournal, "There had been an emporion or trading post on the site from the 2nd century BC, Pola, now Pietas Julia. ^ Wilkes, J. J. The Illyrians, 1992, ISBN 0-631-19807-5, page 96, ". ^ Croatia, 2nd: The Bradt Travel Guide Croatiaby Piers Letcher, 2005, ISBN 1-84162-113-7, page 225, ". ^ Austria: Her People & Their Homelands by James Baker, "... dates back to the sixth century B.C., when the Greeks founded here Epidaurus. ^ Lonely Planet Eastern Europe by Paul Greenway, page 852, "Founded by the Greeks, Ulcinj. ^ Wilkes, J. J. The Illyrians, 1992, ISBN 0-631-19807-5, Page 114, "... in the early history of the colony settled in 385 BC on the island Pharos (Hvar) from the Aegean island Paros, famed for its marble. ^ Pliny's Natural History, Book 3,(C. Plinii Secundi Naturalis Historiæ, Liber III),CHAP. 23. (19. ^ Apollonios Rhodios The Argonautika, Ed. Peter Green, University of California Press, 1997, 2007, p. 428. ^ Wilkes, J. J. The Illyrians, 1992, ISBN 0-631-19807-5., page 279, "We cannot be certain that the Arbanon of Anna Comnena is the same as Albanopolis of the Albani, a place located on the map of Ptolemy. ^ The Illyrians by J. J. Wilkes, 1992, ISBN 0-631-19807-5, Page 258, "In the south the new city named municipium Dardanicum, was another 'mining town' connected with the local workings (Metalla Dardanica)." ^ The central Balkan tribes in pre-Roman times: Triballi, Autariatae ... by Fanula Papazoglu, 1978, page 198, "... the Peutinger Table marks 40 miles from Naissus, on the Naissus-founded by Auielian. ^ The Roman army as a community: including papers of a conference held at ...by Adrian Keith Goldsworthy, Ian Haynes, Colin E. P. Adams, ISBN 1-887829-34-2, 1997, page 39, "...the colony at Scupi which lost its original title Domitiana after Domitians death. Miraj, Lida, ‘The Earliest Coinage of Epidamnos/Dyrrachion as a Source’, Greek Influence along the East Adriatic Coast, Proceedings of the International Conference held in Split, September 24-26, 1998 (Split 2002), 435–470. Kjo faqe është redaktuar për herë te fundit më 14 shkurt 2018, në orën 23:56.